The Shipper’s Declaration for Dangerous Goods is a widely misunderstood part of the hazmat transportation process. According to the Pipeline Hazardous Materials Safety Administration (PHMSA), mistakes in filling out the form constitute “one of the most frequently cited violations of … 49 CFR.” These mistakes are unfortunate because employees must understand the importance of this document in preventing incidents – and, potentially, civil penalties. Here is some information on hazmat shipping papers. What is the Shipping Paper’s Purpose? The people involved in the hazmat transport process need to know the specific details of the dangerous goods that they are handling and shipping. They especially need to know exactly what hazards these materials pose. Different hazards will require different precautions, and containment practices that are effective against one type of danger may be useless against another. Hazmat employees, in short, must know what they are in for. 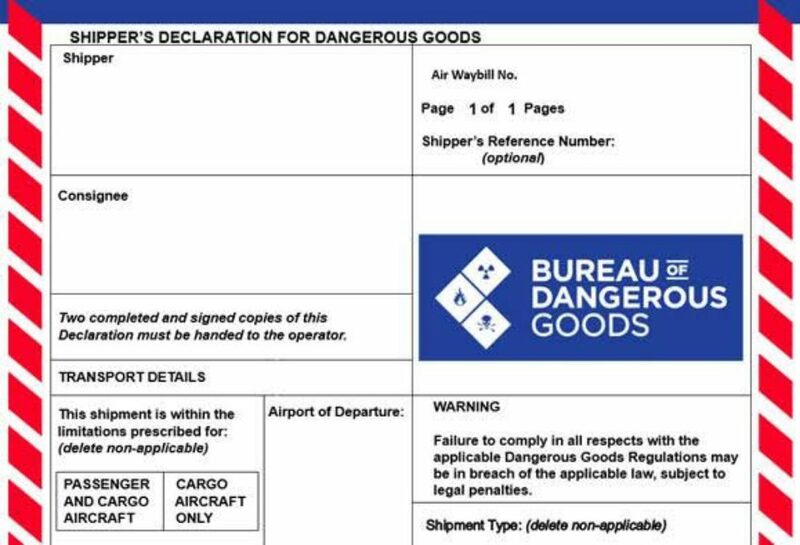 The purpose of the Shipper’s Declaration for Dangerous Goods is to include all this and more information in one convenient document. Once the shipper fills out the form with the required details, everyone down the line can use it as a reference for how they should and should not treat the shipment. Thanks to the shipping paper, they will know what precautions to take, what packaging type was used, and what mode of transport is suitable for carrying the package. Of course, hazmat shipping papers do more than inform hazmat employees. They provide first responders with the information they need to handle a hazmat emergency involving this specific material. They also serve as a record of the item’s transport. All this is why 49 CFR and international regulations require hazmat shippers to provide carriers with shipping papers when applicable. What Do You Include in a Shipping Paper? This may seem like quite a bit of information, but there is more to the shipping paper than the Basic Description. You must also indicate the package(s) amount of the hazardous material being shipped. This typically requires representing the quantity of the material in mass or volume. On that note, the shipping paper, finally, should include the number and type of packages. Depending on the material transported, you may have to comply with still more requirements for the description. The information in this article is intended to bring some greater insight into the importance of the hazmat shipping paper. It is not designed to serve as a substitute for formal training on the subject. Hazmat employees must undergo training so they can understand the finer details on this and all areas of dangerous goods handling. Consider using tools and technology to assist in the shipping paper preparation. Hazmat University provides comprehensive online training in working with hazardous materials. We cover shipping papers in all of our courses, including training for shipping by ground, shipping by air, shipping by vessel, or multimodal shipping. Get started with us today.